Context: Intraoperative consultation frozen section (FS) provides a surgeon background and management plan for surgery. Surgeons' and pathologists' coordination between each other including their departments' cooperation for FS management is very important. The role of FS in the intraoperative consultation is important. It is always advisable to consult an experienced histopathologist specially trained for CNS lesions for intraoperative consultation. Aims: Frozen section (FS) diagnosis provides surgeons, physicians, and pathologists a provisional diagnosis to plan out their management plan. By this study, we intended to evaluate the importance of intraoperative consultation-FS diagnosis in central nervous system (CNS) lesions. In this study, the diagnostic accuracy and the various limitations of using FS of CNS tumors were determined. Subjects and Methods: In this study, we analyzed retrospectively, the results of FS and final diagnoses of all CNS tumors were made at our institute for the duration of 1 year from July 2014 to June 2015. Ethical Standards: We all authors state that all human studies have been approved by the Institutional Ethics Committee. We all authors also gave our informed consent before their inclusion in the study. Details that might disclose the identity of the subjects under study have been omitted. Results: We studied 252 cases of age group from 1 to 76 years. Out of which, 155 (61.50%) cases had complete concordance between FS and final diagnosis, 77 (30.5%) cases had a partial concordance, and 20 cases (8.0%) were discordant. Considering the concordant and partially concordant cases, the accuracy rate was 92.0%, sensitivity was 93.42%, specificity was 91.66%, and positive and negative predictive values were 94.66% and 59.45%, respectively. Conclusions: A Kappa agreement score of 0.75 (substantial agreement score) showed high concordance for FS results with the permanent section. We came to the final conclusion that high sensitivity and specificity were seen with FS diagnosis in the CNS tumors. Intraoperative consultation frozen section (FS) provides a surgeon background and management plan for surgery. Surgeons' and pathologists' coordination between each other including their departments' cooperation for FS management is very important. FS diagnosis helps the surgeon to determine the best procedure and the end-point of the operation in central nervous system (CNS) lesions specifically., Many studies have confirmed the accuracy of FS diagnosis for the assessment of the CNS lesions, with acceptable sensitivity., We retrospectively studied the reliability of FS diagnosis for CNS lesions at our institute over a period of 1 year. We studied 252 cases and analyzed retrospectively the results of FS. Final diagnoses of all CNS lesions were made in at our institute for the duration of 1 year, i.e. from July 2014 to June 2015. According to sample size and consistency, representative sections were taken by an attending pathologist during FS consult. Various preparations were used such as touch, crush, imprint, and squash. After proper cooling in a cryostat, frozen tissue was made into small sections. After proper formalin fixation, additional representative sections were taken for paraffin embedding and routine hematoxylin and eosin staining. After an accurate microscopic examination of all slides, consultant histopathologist gives a definitive diagnosis. All the cases were graded into three degrees of diagnosis concordance to clarify the accuracy of intraoperative diagnosis. All pathological reports were reviewed retrospectively. There was no ethical problem during this study. Around 252 cases were reviewed from the Department of Pathology at our institute. The results from the permanent sections were used as a gold standard. The reports of frozen and permanent sections were evaluated according to the status of cases as benign or malignant and histological type of the lesions. In all the cases, the definitive diagnosis was made after a thorough microscopic examination of all slides. The overall sensitivity, specificity, false positivity, false negativity, positive predictive value (PPV), and negative predictive value (NPV) of FS were determined according to the type of the lesions and the accuracy of histological tumor types. Histological diagnosis was made according to the criteria set forth in pathology textbooks for the diagnosis of CNS tumors., For histological typing of tumors, Armed Forces Institute of Pathology and the WHO classification of CNS tumors recommendations were followed. FS diagnosis was incorrect and different from the final diagnosis. All statistical analyses were performed using Microsoft Excel 2010. To evaluate the agreement of the methods, we utilized sensitivity, specificity, NPV, and PPV. To describe data, we used mean, standard deviation, median, and percent. Out of all cases, 159 (63.1%) were male, and 93 (36.9%) were female. In addition to that, 155 cases (61.5%) had complete concordance between FS and final diagnosis, 77 cases (30.5%) had partial concordance, and 20 cases (8.0%) were discordant. In all the cases, the age of the patients ranged from 1 to 76 years (mean age - 38.5-year-old). Considering the concordant and partially concordant cases, following statistical results were obtained. The accuracy rate was 90.11%, sensitivity was 93.42%, and specificity was 91.66%. Positive and NPVs were 94.66% and 59.45%, respectively. A kappa agreement score of 0.75 (suboptimal agreement) shows high concordance of FS results with permanent sections [Figure 1]. 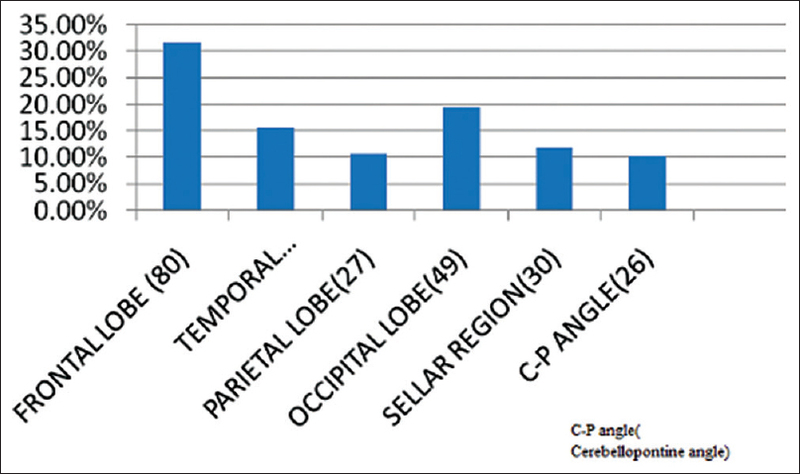 Lesions were located in frontal lobe 80 (31.7%), temporal lobe 40 (15.8%), sellar region 30 (11.9%), parietal lobe 27 (10.7%), occipital lobe 49 (19.4%), and cerebellopontine angle 26 (10.3%) [Table 1]. FS - glial tumor, permanent: Astrocytoma or ependymoma; FS - low-grade glial tumor, permanent: Ganglioglioma; FS - positive for malignancy, permanent: Metastatic tumor; FS - benign spindle cell tumor, permanent: Schwannoma; FS - malignant round cell tumor, permanent: Lymphoma; FS - granulomatous lesion, permanent: Tuberculous lesion or tuberculoma; FS - inflammatory process, permanent: Fungal inflammation [Table 2]. There were cases having incomplete or inaccurate data, which were put off. For example, six cases astrocytoma, two cases of dysembryoplastic neuroepithelial, one case of medulloblastoma, one case of hemangioma, one case of ependymoma, one case of choroid plexus papilloma, and one case of rhabdoid meningioma. Through intraoperative consultation (FS), pathologists can provide surgeons a diagnosis, which will help surgeon to decide a subsequent surgical approach. In addition to that, FS diagnosis can inform the surgeon as to whether the biopsy is taken from the appropriate area and the adequacy of the specimen, which in turn can help the pathologist to make a final diagnosis. Most diagnostic accuracy was 92.4% in “Talan Hernilovic” study and 95% in “Roessler” study with 89% complete concordance among 4172 patients. In a referral center in Pakistan, the diagnostic accuracy was 88.9% in CNS neoplasms for 171 cases. The most accurate FS diagnoses were made in cases of meningioma (97.9%), metastasis (96.3%), and glioblastoma (95.7%). “Thomas Plesec et al.” study had <:3% discordancy among 2156 cases during an 8-year period in his study. Approximately 80% of the discrepant cases, most of which were lymphoma, astrocytoma versus oligodendroglioma, reactive versus neoplastic process, and misclassification of tumor grading. A French study of 1315 cases was found having 96.6% concordance between FS and permanent diagnoses [Table 3]. Our results showed a high accuracy for FSs in the diagnosis of CNS lesions (92%) when concordant, and partially concordant cases were included and considering partially concordant cases were correct but not as accurate as completely concordant diagnoses [Table 4]. In our study, 155 of 252 cases were in complete concordance. Most of our discordant results were in astrocytic tumors (five cases), followed by CNS metastatic tumors, primitive neuroectodermal tumor, medulloblastoma, and ependymal tumors. A total of 84% (21 cases) of meningiomas were diagnosed correctly with FS analysis. There were multiple factors which contributed to inaccurate FS diagnoses, majority of which were improper slide preparation, lack of pathologist expertise, and inadequate sampling. The lack of communication between pathologists and surgeons was one strong factor among that. Because of all these factors, sometimes, it is difficult to diagnose cytoplasmic processes and fibrillary patterns in FS slides, which makes it impossible to differentiate glial tumors from carcinoma, lymphoma, and melanoma. Wrong FS diagnosis of astrocytoma in some cases could be due to the improper method of staining and cutting, which in turn could have disrupted cellular morphology (two of our cases). The diagnosis of ependymoma by FS is easy; however, sometimes because of the presence of perivascular rosettes makes it difficult to differentiate it from medulloblastoma. Pituitary adenoma could have been misdiagnosed as malignant round tumors in FS due to round monomorphic cells in the pituitary adenoma as was the case in one of our patients. Admittedly, FS diagnosis carries an enormous amount of importance. Appropriate communication between pathologists and neurosurgeons with adequate information about the radiologic findings is helpful to minimize FS misdiagnosis. The results of our study show a high percentage of accuracy in the intraoperative diagnosis of CNS lesions. Although inadequate biopsy samples, pathologist misguidance, suboptimal FS preparation, and inadequate information radiologic findings were major causes of discrepancies in our study, the role of FS in the intraoperative consultation is important. It is always advisable to consult an experienced histopathologist specially trained for CNS lesions for intraoperative consultation. Taxy JB, Anthony G. Biopsy Interpretation: The Frozen Section. 1st ed. China: Lippincott Williams and Wilkins; 2010. p. 301-3. Somerset HL, Kleinschmidt-DeMasters BK. Approach to the intraoperative consultation for neurosurgical specimens. Adv Anat Pathol 2011;18:446-9. Regragui A, Amarti Riffi A, Maher M, El Khamlichi A, Saidi A. 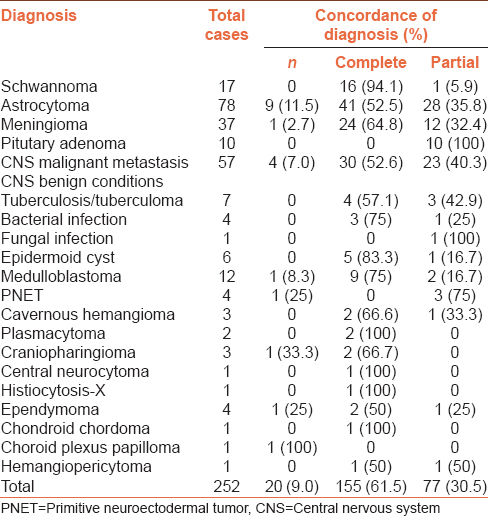 Accuracy of intraoperative diagnosis in central nervous system tumors: Report of 1315 cases. Neurochirurgie 2003;49(2-3 Pt 1):67-72. Ud Din N, Memon A, Idress R, Ahmad Z, Hasan S. Central nervous system lesions: Correlation of intraoperative and final diagnoses, six year experience at a referral centre in a developing country, Pakistan. Asian Pac J Cancer Prev 2011;12:1435-7. Burger PC, Scheithauer BW. Tumors of the central nervous system. In: AFIP Atlas of Tumor Pathology Series 4. Washington, D.C.: American Registry of Pathology; 2007. Plesec TP, Prayson RA. Frozen section discrepancy in the evaluation of central nervous system tumors. Arch Pathol Lab Med 2007;131:1532-40. Talan-Hraniloviæ J, Vuèiæ M, Ulamec M, Belicza M. Intraoperative frozen section analysis in of the central nervous system and pituitary gland pathology. Acta Clin Croat 2005;44:217-21. Roessler K, Dietrich W, Kitz K. High diagnostic accuracy of cytologic smears of central nervous system tumors. A 15-year experience based on 4,172 patients. Acta Cytol 2002;46:667-74.